Manley, born July 29, 1887 in Pewee Valley, Kentucky, was the eldest of General Lawton's four surviving children,. It's one of the reasons he doesn't have as big a part in the later Little Colonel stories as his sisters. Basically, he just grew up too soon. In the Little Colonel stories, he is the model for "Ranald, the Little Captain." Already in his name for the stories, we get an interesting historical connection. One of General Lawton's closest friends during the Indian Wars was General Ranald S. MacKenzie. This is one of the points that leads us to confirm that General Lawton's wife Mary (Mamie), "Mrs. Walton", had more than a little influence in naming the characters in the Little Colonel books. In that fictionalized Little Colonel version, "The Little Captain" was noted to have participated in some valiant war incidents quite beyond what would normally be expected for a boy of his age at the time, including following his father into battle. We wonder how many, if any, contemporary readers of the time would have been surprised that far from being fiction, this was actually true. Manley was quite famous in his own right, having been portrayed in quite a number of magazine and newspaper articles of the time, and sometimes having been referred to as the youngest officer in the army. In real life, Manley was named after his uncle. Manley was born on July 29,1887. His father and uncle Manley were very close. In fact, General Lawton had talked about retiring in California in order to live close to his brother. He even purchased, and lived for the briefest while, in a quite comfortable home in Redlands, California. Manley attended military academy as a young man, and later had two daughters. Helived much of his adult life in Washington, D.C., where he worked at the Capitoluntil fairly shortly before his death on Jan 11, 1960. The bright faced youngster pictured here is the twelve year old son of that gallant, old campaigner, Major General H. W. Lawton, now seeing active service with the troops in the Philippines. Young Lawton is an aide to Gen. Fred Grant, and as such has the rank of Captain. he is displaying qualities that mark him every inch a soldier, and all the officers are proud of "The Little Captain." Just after it was announced that the boy had been made an aide to Gen. Grant, the appointment carrying with it a captain's shoulder straps, the following poem was written and dedicated to him by Mrs. Annie Fellows Johnston, author of "A Boy of Galilee:"
Which they must wear ere long. Pewee Valley, August 29, 1899 -- Annie Fellows Johnston. General Lawton's Son Served Faithfully in the Manila Campaign. LEXINGTON, Kentucky Sept. 21 - The Kentucky State Guard numbers among its' members the youngest individual that ever donned shoulder straps in the united States army or who has been under fire in battle. This person is Capt. 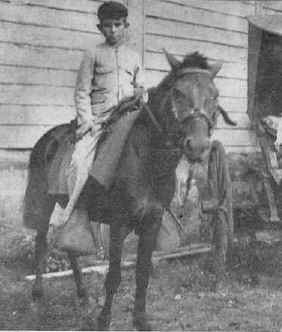 Manley Lawton, now but thirteen years old, the son of General H. W. Lawton, who fell at San Mateo while charging a Philippine stronghold across a rice field, who is now bugler for the First Battalion of artillery, Kentucky State Guard. At the tender age of eleven years this boy was on the firing line and under fire. 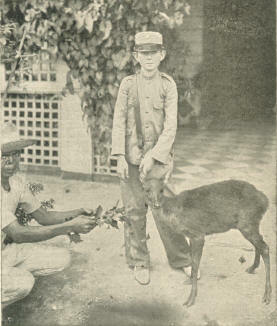 He went to the Philippines with his father and served in various commands until his father's death, in December, 1899. 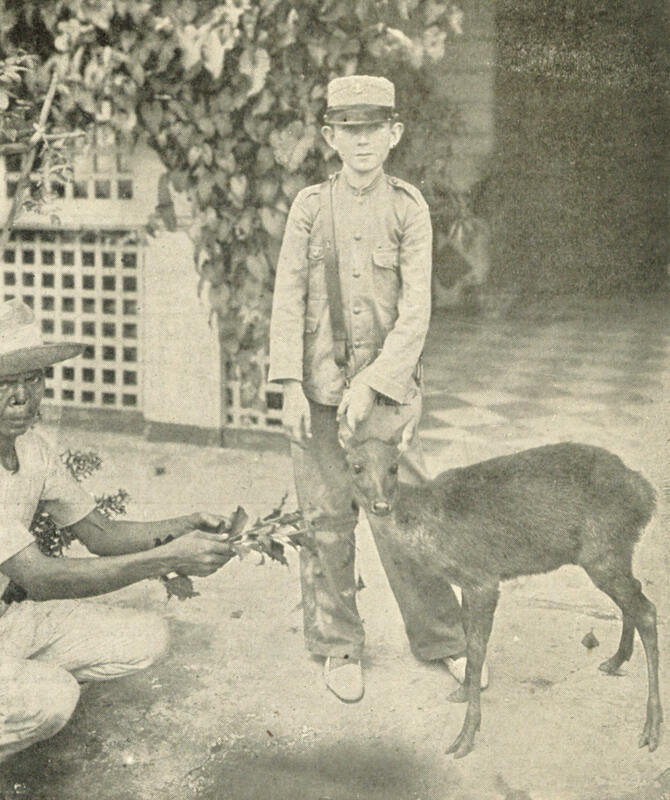 Immediately upon his arrival in Manila, and before his father was given a command, this boy went with General MacArthur to the front, where they found themselves under fire. General Lloyd Wheaton's brigade had advanced from San Pedro Macati to Guadalupe Ridge and encountered the enemy. The courage displayed by this child while the battle raged was a matter of comment among the officers. Soon after this he was assigned to the position of volunteer aid on his father's staff, with the rank of captain. He served faithfully and well, going through the entire campaign, taking part in all the expeditions and enduring the same hardships as others of the command. Before starting on the long northern expedition with his father in Luzon, the result of which meant so much, he served for some time as aid to General Fred Grant while the latter was stationed in Bacoor. When General Lawton left Manila the night of December 18 for San Mateo it was the first time Manley did not accompany him. The boy was not well and the storm was so great that the young soldier's mother detained him. The next morning his father fell. Manley returned to the States with his mother, whose mourning was that of the nation. The mother has taken up her residence at Pewee Valley, near Louisville, where young Lawton is much admired by the citizens, being seen almost daily riding his Philippine pony which he brought to America. He was much admired at the recent encampment of the State Guard at Owensboro, where he recited entertainingly to Gov. 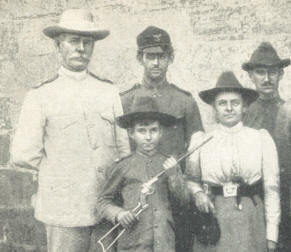 Beckham, General John B. Castleman, and other officials, his experiences in the Philippines. The records show young Lawton's assignments in the Philippine service as follows: Arrived in Manila March 10, 1899. 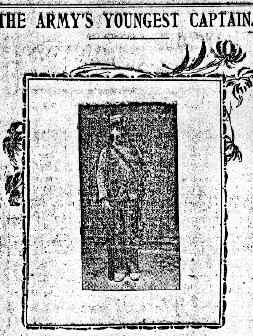 Reported June 10 and tendered his services to the division at Las Pinas, June 13 present at the battle of Zapote River. July 4 appointed captain and volunteer aid-de-camp. Accompanied the division commander on launch and was present at the capture of Calamba, July 26. August 9 was announced aid-de-camp to Brig.. General Fred Grant. On August 9 he was directed, in addition to his other duties, to assist Capt. William M Ekin, brigade quartermaster, in charge of the repair of roads in the vicinity of Bacoor. October 16 departed with the division commander on his expedition to the northern part of Luzon. Note: Kentucky Governor Beckham mentioned above had a daughter, Eleanor, who drew two of the game playing pieces for the Little Colonel game!